This past summer I didn’t know it yet, but I was BURNT OUT. I had been working non stop in my business without a break for 2 years and had a tragic family loss that I kept working through, thinking “taking a break” would only make things worse. Until I started losing motivation, I didn’t want to think about my business let alone manage it. I did the bare minimum to get by and not “close shop”. I was unmotivated and uninspired to say the least. On the side I’d been planning a trip to Spain for my mom’s 60th birthday and was looking forward to it because it was going to be my first break in two years. 2 weeks away without my laptop! My only plan was to be present and not think about my business. 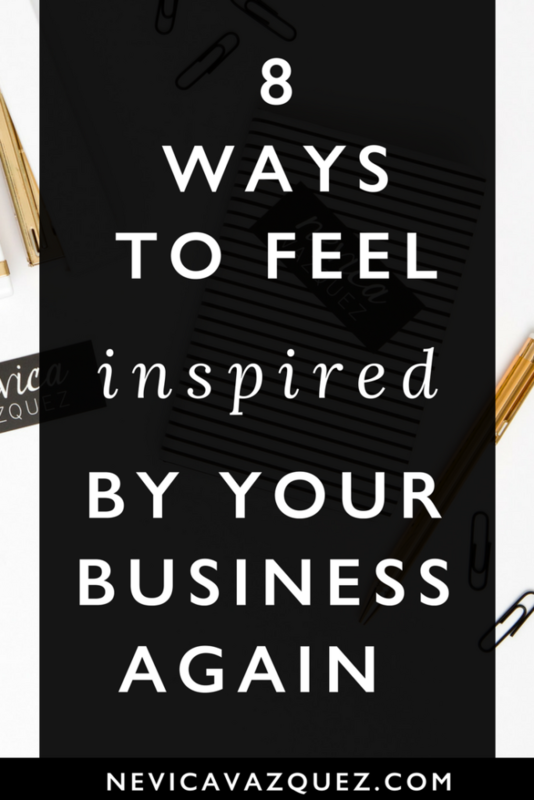 Have you ever taken time off from your business, then get all these new ideas while you’re trying NOT to think of your business? Funny how that works right? Well on my trip to Spain, the trip I was supposed to spend not thinking about my business (because I was pretty much sick of it) that exact thing happened. I was constantly inspired by new ideas all around me the entire trip. I interacted with a ton of small businesses and street sellers while I was there and was so motivated by them. I certainly get so caught up in our online world that I forget there’s a bigger world of business owners out there. So it was a nice change. Now I’m not telling you to travel across the world to get inspired by your business (although it’s always a great idea) but I am telling you to break your routine! While one or more of these steps may help you recharge with inspiration, if you want to hear about exactly what re-inspired me on that trip to Spain here are 5 of the business lessons I learned while in Spain. Being from NYC I’m used to seeing streets filled with people selling things. A lot of the time what’s being sold are really cheap “trinkets” you don’t need. So I’ve become accustom to not even looking their way. But while in Spain this one guy was selling the most peculiar toy. He caught my attention because he had a radio playing music and had a small crowd around him. I looked in to see what all the fuss was about and he was selling these weird dancing cartoon characters. Think a 2D version of Bart Simpson, with stick legs, some how standing up and dancing. 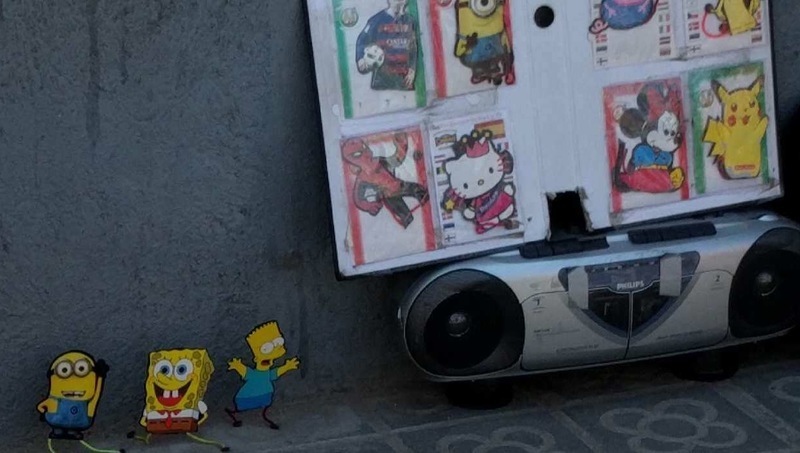 Everyone was trying to figure out how this 2D paper looking toy was dancing. Because of that curiosity, instead of ignoring this street seller (like they were to all the others next to him) a crowd formed around him, asked questions, took pictures and videos, and even bought the toy! LESSON: Draw people in with curiosity. Curiosity is what formed the crowd which then gauged my interest. Curiosity starts conversations. If you don’t say things how people want to hear them you won’t make the sale. Besides street sellers I also came across a ton of street musicians while in Spain. I’m sure I saw at least 50 while there. And I only gave money to and remember one. Why? Because it was this old man on a guitar who out of no where starts singing Despacito (the popular justin bieber song)! Everyone in the plaza literally stopped what they were doing, went over to sing and dance with him, then gave him a tip. LESSON: Meet people where they are with what they know. You will catch their attention and they will be thankful they found you. want to learn more about creating the right messaging for your marketing? take my free 5 day marketing course here! As I said I really don’t buy anything from street sellers because it’s normally not something you need. But this one woman in Spain knew what she was doing! To visit any of the beautiful churches in Spain you need to have your shoulders and stomach covered out of respect. Two problems: one it’s like 90 degrees everyday in the summer so most people are dressed showing skin and don’t have sweaters, and two most tourist don’t know this rule. Which means? Opportunity to sell scarves right outside of the church so that anyone who wants to go in can cover themselves and go in! I didn’t see any street sellers making as much money as this woman selling scarves, I was so impressed. She was solving an immediate need! LESSON: Make sure your product/service is something people need and sell it somewhere where their need for it is urgent. If you’ve planned a big trip before then you know that as the days get closer you’re both excited, nervous, and a little overwhelmed that you may forget something or miss a detail. 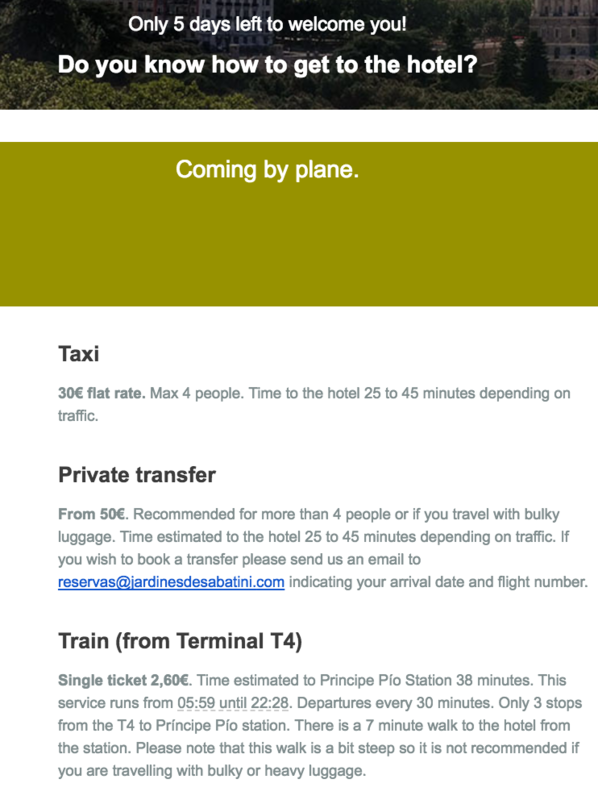 So I couldn’t be happier when I got an email from one of the hotels I was staying at telling me: all the possible ways I could get there, how to get around once in the city, and best things to do near the hotel. It was so thoughtful! LESSON: Think of how you can add value to your customers experience before they even get to you. A little goes a long way. While in Spain I attended a guitar trio concert. I’ve never been to anything like this before but Trip Advisor said it was a “must do” so I did it! While there they played Spanish music which I was expecting. But then when they said the concert was over they all came back on stage, used one guitar, played on that one guitar at the same time, and played thriller by michael jackson! It was awesome! I’d never seen that before (three people playing one guitar at the same time) and we all know thriller so everyone could sing along, but the real reason it was great was because it was just so unexpected. Now I’ll tell everyone about them just because of that ending! LESSON: Give people something to remember so their more likely to share it with others. So as you can see getting out of my element really brought my business brain back to life! I was so excited to get back home, back to work, and implement exciting new ideas into my business. So, how are you going to change things up in your daily routine, to get a dose of inspiration?